My eight month old is already walking, not perfectly, but he's determined to perfect it anytime now. He stands up on his own without holding on to anything and just goes. He has been doing this for a few weeks and getting better every day. 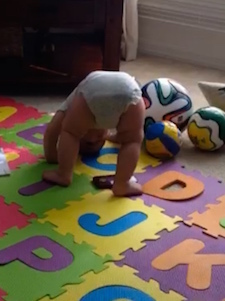 As of a week ago he started doing what looks like a somersault, or trying to do it. He will often get on his head and stand on his tip toes as if trying to push forward to do a somersault. He does it very often, sometimes he stands up after it or he'll do it on top of an object and he'll stand up holding it. But he does stand up on his own without doing this as well. Is this normal behavior? And is it safe? Your son’s “somersaults” are not common, but one of our girls did something similar. Our youngest daughter did something would “bear walk” and then flip over like a somersault. She did it enough that we felt it was intentional. Today, she is a normal, busy, coordinated active 2 1/2 year old. Just let him somersault away. In a safe environment, it is not going to cause him any problems. Even if you wanted to stop him, I doubt you could?